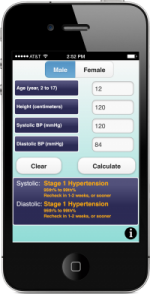 Take 2 Heart has created a quick reference guide for all the supplies a heart care professional needs to take a pediatric blood pressure. A checklist of these items can be downloaded here for personal or classroom/training use: Pedia BP Tools. Not all blood pressure cuffs will fit little arms. Luckily, advances in medical devices have created cuffs in many sizes. The images below will help in selecting an appropriate cuff for your patient. These Welch Allyn blood pressure cuffs are an example of the various sizes available. Hope Bussenius is a 2016 Robert Wood Johnson Foundation Clinical Scholars Fellow. Support for the take2heart initiative was provided by a grant from the Robert Wood Johnson Foundation Clinical Scholars Fellow program.